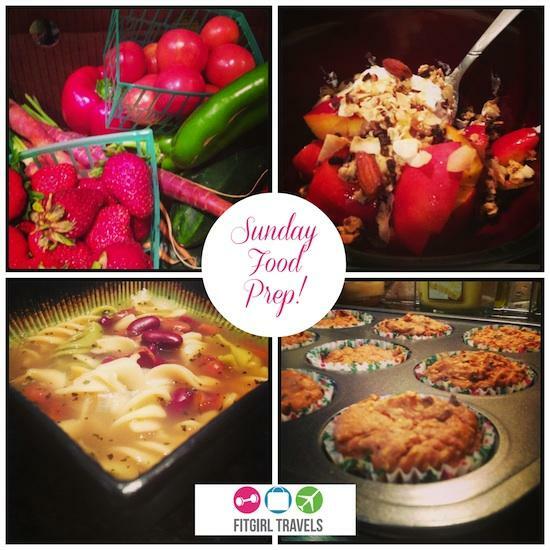 Time for more Sunday Food Prep! 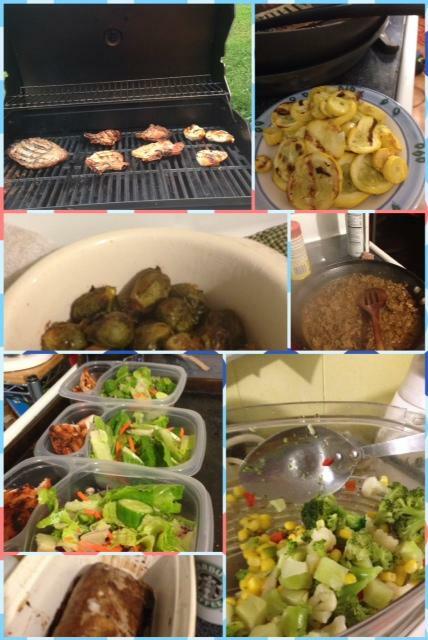 Since hubby was out of town Sunday – Wednesday this past week, I didn’t do much food prep…just made it a goal to use up what we had on hand! But here’s what some of you have been up to! 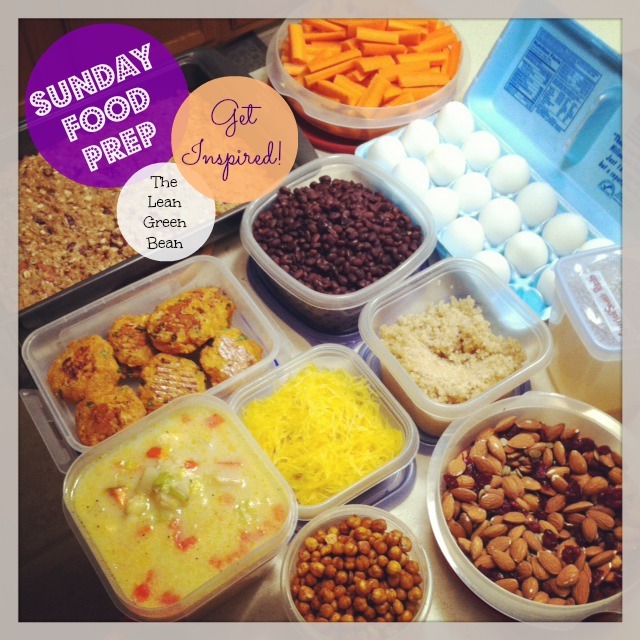 I took on an Eat Local Challenge and prepped food for the week to get ready for it. I shopped at the farmer’s market for most of my food. I cooked up a local chicken and kabocha squash for lunches all week, and used some of the chicken for homemade soup. I chopped up deliciously sweet carrots, cucumbers, and packed up cherry tomatoes for snacks and salads. I also went apple picking and had a lot of apple and cheddar cheese (Cabot cheese – World’s Best Cheddar!) for snacks. 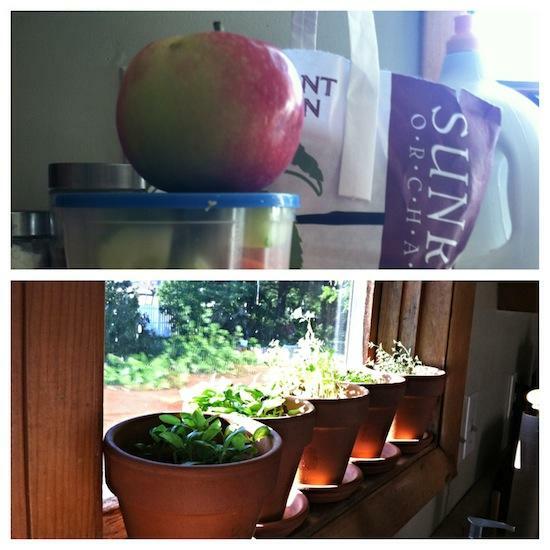 I also had our window-sill herb garden with cilantro, parsley, basil, and thyme to add flavor. 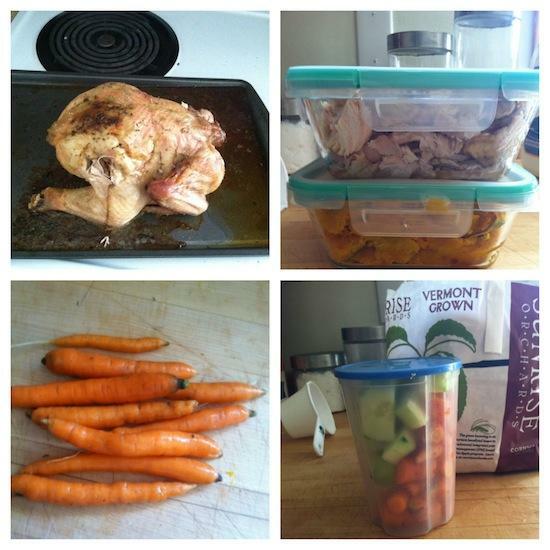 It was a delicious and fun week eating Vermont food, and food prep helped me get through it. To kick off the fall season, I made some yummy pumpkin protein muffins. I usually whip up a batch, put them in small Ziploc baggies, and then stick them in the freezer – that way they’re ready anytime I need a quick breakfast, snack or even dessert. Since I’m especially short on time in the mornings, I usually bring these into the office, heat them up in the micro really quick, and eat them at my desk – my coworkers always comment on how good they smell! My husband said this is the best soup he’s ever eaten! It was also very easy and inexpensive to make! Super easy to make and tastes good by itself, as cereal, or on top of Greek yogurt or ice cream (if you want a special treat!). I store this in an air-tight container so it stays fresh throughout the week. I’ve been ordering a veggie box from a farm in my local area – it makes food prep a lot faster and easier when I have a week’s supply of fruits and veggies delivered right to my door. I usually chop them up and use them in smoothies (like this Green Goddess Smoothie) and dishes throughout the week! I don’t do this all the time because the veggie box can get a bit expensive, but it’s a nice treat every now and then! 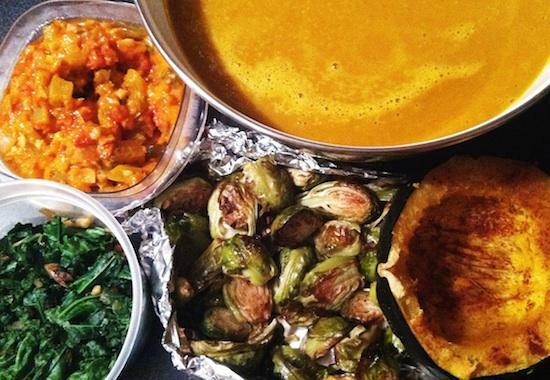 Last week I made 3-tomato pasta sauce, pumpkin and sweet potato soup, roasted acorn squash, roasted Brussels sprouts and sautéed some kale and ginger. 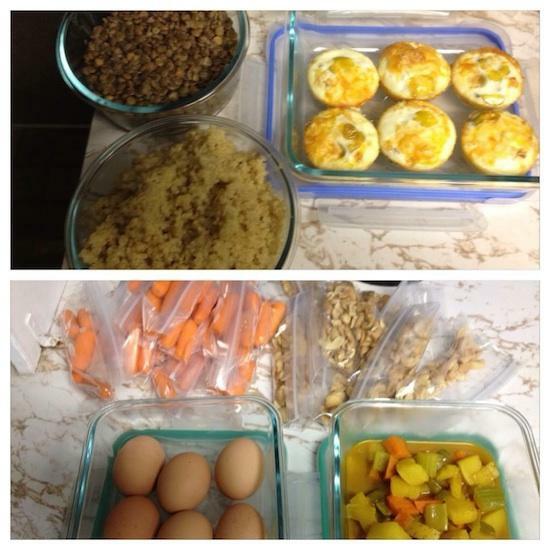 I usually try to make a bunch of side dishes that I can use to mix and match throughout the week. That way, I feel like I’m eating something new everyday but don’t have to spend the time prepping on a weeknight. Kale/tofu calzones, apple almond crisp (with local almonds! 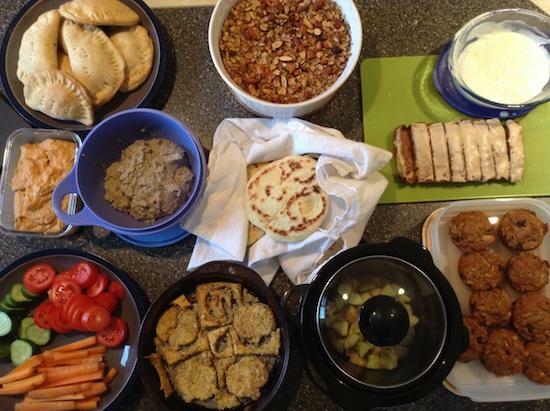 ), a strange almond spread (needs work, but we still ate it all), zucchini/carrot/apple muffins and bars (iced for fun), apple pie millet ready to go in the slow cooker, breaded tofu “pumpkins”, a few of the beautiful vegetables we had this week, roasted red pepper hummus, baba ghanouj, and homemade pitas! Definitely some great ideas in this post – I love the idea of prepping calzones! I’m planning on making some muffins or a quickbread today for snacks during the week. Thanks for sharing all these tips, Lindsay! Thanks so much for including me in this week’s post! Would love to try making homemade pita! 🙂 Roasted acorn squash sounds so good right now too! Is it ok to re-use/re-wash the ziploc bags?